This paper is based on the authors treatment of the family Leguminosae (Fabaceae) for the Arctic Flora of the USSR (Yurtsev 1986) and the draft checklist of legumes for the Panarctic Flora (PAF) project. The basic literature is cited in Yurtsev (1986). The genera Trifolium, Melilotus and Medicago were treated by M.V. Sokolova, Vicia and Lathyrus by A.A. Korobkov, and the other taxa and general sections by the present author. The latest treatment of the genus Oxytropis in Flora of Siberia (Polozhij 1994) and Vascular plants of the Soviet Far East (Pavlova 1989) were also used along with my own survey of North American floras. The Arctic floristic region is delimited in the restricted sense (Fig. 1) as in Yurtsev et al. (1978) and Yurtsev (1994), which excludes the cold oceanic, treeless areas, like northernmost Fennoscandia, Iceland, and South Greenland, Commander-Aleutian island chain and the Anadyr-Koryak stlanik zone. Number of species and subspecies of legumes in the floristic areas of the Arctic s.str. (Yurtsev 1994). The boundaries of: a - the Arctic floristic region s. str. ; b - longitudinal sectors (provinces, autonomous areas); c - areas (subprovinces); d - the abyssal of the Arctic Ocean. Leguminosae (Fabaceae) is the third largest family comprising 18000 species in 650 genera. The largest subfamily Faboideae includes 12000 species in 440 genera.Of this enormous taxonomic diversity, the PAF draft checklist of legumes includes 109 indigenous species and subspecies (123 if adventive species are included), but only 8 indigenous genera (10 with the adventive genera Medicago and Melilotus, cf. Table 1). Five of the genera are circumpolar, and three are restricted to a certain sectors: Trifolium in Europe to Western Taimyr, Caragana in Kharaulakh, and Lupinus in the North American sector (excluding Baffin-Labrador). Only three genera of legumes (Oxytropis, Astragalus, Hedysarum) are typical of the Arctic, and only Oxytropis has undergone intense speciation. The species diversity of legumes among the 23 areas and 7 sectors is extremely uneven and indicates a major role of Megaberingia in populating the Arctic (Fig.1). Megaberingia comprises a number of regions (from East Taimyr to Central Canada), different in terms of landscapes, climates, and floras, but closely connected by floristic exchange via Beringia during the late Cenozoic (Yurtsev 1997). The six areas that totally lack legumes are the two insular areas with oceanic arctic climate, Svalbard (and Franz-Josef archipelago) and Jan Mayen, and four high-arctic continental areas: Ellesmere-Axel-Heiberg and West, North and East Greenland In four areas (Taimyr and Yana-Kolyma, and Central Canadian and West Hudsonian) legumes are lacking in the northernmost subzones where their bumblebee pollinators are absent. In the amphi-Beringian sector species diversity is maximal: 29 taxa in Continental and Beringian Chukotka, 30 taxa in Beringian and North Alaska, 25 taxa in South Chukotka, 26 taxa in the very small Kharaulakh area, 24 taxa in Taimyr (including the lower reaches of the Yenissei River); 23 taxa in Central Canada and West Hudsonian areas. Of the marginal areas, Kanin-Pechora and Ural-Novaya-Zemlya have 1314 taxa, there are 15 taxa in Anabar-Olenek and Baffin-Labrador, 17 taxa in Yana-Kolyma, 16 taxa in high-arctic Wrangel Island, and finally, only 9 taxa occur in Yamal-Gydan (West Siberian Lowland) and 7 in the Beringian Oceanic Arctic area, on the islands of Bering Strait. If the areas are united into sectors, the diversity of indigenous taxa among the sectors will be West Eurasian: 16; East Siberian: 39; Chukotka: 48; Alaska-Yukon: 36; East-Central Canada: 33, and the Beringian Oceanic Arctic: 7. 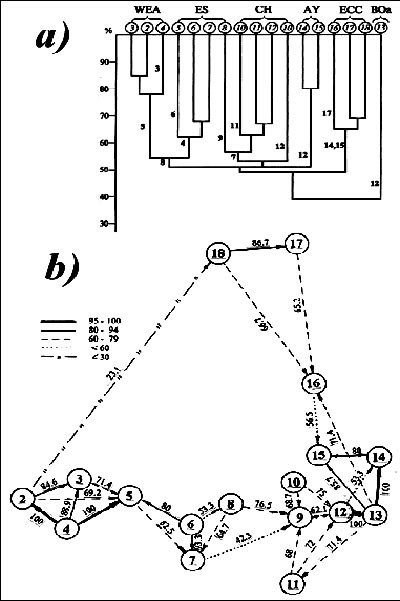 In the dendrogram (Fig. 2a) the areas with legumes are grouped according to their similarity (the similarity index by Sørensen-Czekanovsky). This classification led, with one exception in the Yana-Kolyma area, to the grouping of the areas as they are situated geographycally (see Fig. 1). The Beringian Oceanic Arctic area joins the dendrogram at the lowest level of similarity (39%). Most of the clusters join each other at similarity levels between 62 and 68%, which confirms sufficient floristic diversity. The East Siberian (plus West Eurasian) and the Alaska-Yukon sectors join the Chukotkan sector at the same level of similarity (51%), and the East-Central Canadian sector joins at the level of 49%. The oriented orograph (Fig. 2b) is based on the Simpson similarity index, which reflects the relation of a part to the whole. The most important result of this comparison is that both the poorest floras (Yamal-Gydan and Beringian Oceanic Arctic) are 100% included into the neighbouring floras. The direct comparison of the Beringian Chukotka and the Beringian Alaska sectors shows much lower similarity, only 53%. The western (left) part of the orograph (from the Kanin-Pechora to the Kharaulakh area) is united at the level of 80% and higher. The same is true for the Beringian and North Alaska and the marginal West Hudsonian and Baffin-Labrador areas. The Kanin-Pechora and the Baffin-Labrador areas join at the lowest level (23%). The Yana-Kolyma area comes closer (76.5%) to the Continental Chukotka than to both of the western neighbors in East Siberia. The differential elements (legumes only) of the flora of the Beringian Chukotka and Beringian Alaska (both the positive and negative ones, cf. Yurtsev 1994) are presented in Table 2. The table reflects prominent differences in legumes sets between the West and East Beringia. In general, arctic legumes with their tendency to allopatric speciation provide a rich material for floristic division of the study area. Of the total of 109 taxa, there are 26 stenochoric endemics (15 of them being endemics of a single area), 19 subendemics (14 being metaarctic stenochoric endemics), while other differential species total 43. The Metaarctic is a territory comprising the Arctic itself along with the more or less adjoining subarctic alpine (also treeless) terrain within the northern taiga subzone (Yurtsev 1997), as a continuation of the Arctic. Owing to the neighborhood to the Arctic, rather distant subarctic alpine floras have been interconnected via the Arctic and developed as a whole with it. This is supported by the high number of species in common for distant sectors in the Subarctic alpine floras in the Subarctic (not only circumpolar taxa), and still higher floristic connections between arctic and subarctic floras in each sector. There is also a significant number of co-differential species with their clear west/east boundaries in the Arctic. Not a single amphi-Atlantic or true circumpolar species of legume is, however, observed. a) Dendrogram of maximal similarity of floristic areas of the Arctic by the composition of species and subspecies of legumes (Sørensen/Czekanowsky similarity index). Figures along vertical lines give the number of the floristic area most similar to the given area: b) Oriented graph of the Simpson similarity index (the maximal inclusion). The figures in circles are the number of floristic areas; those along arrows represent the similarity index (%). Floristic areas are as follows: West Eurasian sector (WEA. ): 1. Svalbard, 2. Kanin-Pechora, 3. Ural-Novaya Zemlya, 4. Yamal-Gydan; East Siberian sector(ES. ): 5. Taimyr, 6. Anabar-Olenek, 7. Kharaulakh, 8. Yana-Kolyma; Chukotka sector (CH. ): 9. Continental (North) Chukotka, 10. Wrangel Isl., 11. South Chukotka, 12. Beringian (East) Chukotka; Beringian Oceanic arctic sector (BOa): 13. North Beringian insular; Alaska-Yukon sector (AY): 14. Beringian (West) Alaska, 15. North Alaska; East-Central Canada sector (ECC): 16. Central Canada, 17. West Hudsonian, 18. Baffin-Labrador, 19. Ellesmere; Greenland sector (G.): 20. West Greenland, 21. North Greenland, 22. East Greenland; North Atlantic Oceanic arctic sector (NAOa): 23. Jan Mayen Isl. Only few subdivisions of the genus Oxytropis have contributed to the arctic florogenesis and speciation. Two of them (Oxytropis deflexa s.lat. of the subgenus Phacoxytropis and numerous species of the section Arctobia of the subgenus Oxytropis) exhibit some primitive (phacoid) characters. In Arctobia species these are combined with features of specialisation to alpine and arctic environments (Yurtsev 1997). The diversification processes (speciation, race formation) have been prominent in the four sections of the type subgenus. Geographic isolation has resulted in allopatric speciation, which in some groups has been complicated by polyploidy, sometimes within a single race (e.g. Oxytropis leucantha subsp. tschukotcensis with 2n=48, 64, 96, even within the same local population). In the Oxytropis campestris superaggregate (see below) the lowest ploidy level in Eurasian species and races is 2n=48, whereas there are taxa with 2n=16 and 32 in the western North America. Sometimes we find the case of autopolyploidy without any visible morphological distinctions between diploid and tetraploid plants within a local population (e.g. in O. gorodkovii in the easternmost Chukotka Peninsula, 2n=16 and 32). In other cases polyploidy has accompanied and consolidated evolutionary adaptation to contrasting cold treeless environments (as, e.g., in the sequence: O. sverdrupii 2n=48 ® O. wrangelii 2n=64, or O. viscida aggregate (agg.) 2n=16 and 32 ® O. middendorffii agg. 2n=48). But there are cases of pseudo-vicarism i.e. allopatric situations, where vicariant taxa are good species: e.g. Oxytropis nigrescens 2n=16 > O. czukotica 2n=32 of the O. nigrescens agg.. The boundary between them is running along the divide between drainages of Alazeya and Kolyma Rivers on the plains and between drainages of the Indigirka and Kolyma rivers in mountainous Northeastern Asia. The species differ in a number of characters, both qualitative and quantitative, and are readily distinguishable and identifiable. In general, speciation within the subsection of Arctobia (O. nigrescens agg.) has occurred on the diploid level (Yurtsev 1997). The evolution of northern oxytrops occurred either with retention of the general morphotype (including the biomorph) of a given group or with transformation of the morphotype. The first case is more typical of the racial differentiation of hypoarctic and arctic-boreal species or in the formation of a series of close vicarious species with similar ecology. The hypoarctic species (or subspecies), penetrating the southern subzones of the tundra zone (races of Oxytropis adamsiana agg. or O. leucantha agg. ), usually show parallel clinal variation, from the south to north, in a number of characters, such as size and shape of leaves, leaflets, scapes, spikes, bracts, calyx, the density and length of pubescence (e.g. reduced the length and density of longer white hairs on calyx, bracts and pods, increased density and length of black hairs on the same organs). Adapting to much colder harsh environments (e.g. true arctic and/or alpine ones) usually leads to the transformation of a morphotype and to speciation, with some features of convergence. This is characteristic for arctic or metaarctic species as Oxytropis arctica, O. middendorffii s. lat., O. sordida s. lat., O. wrangelii. Section Mesogeae of the primitive subgenus Phacoxytropis (similar to the subgenus Phaca of the ancestral genus Astragalus) is represented in the Arctic by three races of Oxytropis deflexa: subsp. deflexa (East-Siberian  North-Mongolian hypoarctic-montane subspecies), subsp. dezhnevii (low arctic subspecies with four localities in the easternmost Chukotka Peninsula), subsp. foliolosa (hypoarctic Alaskan-Canadian); and  subsp. norvegica (mountains of Northern Norway). Both marginal Eurasian races  subsp. norvegica and subsp. dezhnevii  are morphologically closer to the American races, than to the ancestral subsp. deflexa. It has been shown, however, by Høiland & Laane (1989) that the strongly isolated, Norwegian race is well separated from both the Asian and North American populations by the phytochemistry of flower substances. They explain it by rapid chemical evolution of flower substances in the very small population over the last 10 thousand years (its origin from Siberian populations of an Early Holocene migration). In this respect, the chemistry of flower substances has asserted itself as evolutionary rather flexible - so, one cannot exclude that some diagnostic macromorphological characters could remain more stable throughout the same time span. The taxonomical rank given to the races by different taxonomists varies from that of variety to species. Perhaps the rank of all the Eurasian races should be raised to that of species of O. deflexa agg. Section Arctobia sensu Barneby was analysed in detail by Yurtsev (1997). It comprises mostly ancient (Neogene?) alpine plants and their Quaternary descendants, specialized to windswept detrital habitats,. The evolution from hemicryophytes (subalpine plants) to cryophytes was followed by the retarding of growth and by oligomerization, i.e. decrease in number of leaflets per leaf and flowers per inflorescense, which becomes an important taxonomical character. It has been shown (Yurtsev 1997), that the taxonomical structure of the section is complex, which permits to suppose several stages of speciation, mostly on the diploid level. Most of the subsections and all the three series are oligotypic, differing in morphotype. When series of the subsection Arctobia are sympatric, this is due to specialization to different substrates, e.g. carbonate versus acidic. The view that all (or almost all) species of the series Nigrescentes are subspecies of Oxytropis nigrescens cannot be supported. The East Siberian O. nigrescens (diploid) is closer than all the other members of the subsection to the presumable ancestor, with less oligomerization: spike of 34 (up to 5) flowers instead of 1 or 2, leaflets 1319 instead of 57 (11), bracts narrowly lanceolate, longer than pedicels. In Chukotka O. nigrescens is replaced by the two other species of the same affinity: O. czukotica, an acidophilous creeping plant (2n=32) and the amphi-Beringian O. gorodkovii, which is calcicolous, pulvinate (normally diploid, 2n=16). Where acidic rocks are intermingled with carbonate ones, O. czukotica is sympatric (in some parts of Chukotka) with O. gorodkovii  they replace one another even on microhabitats differing in soil pH. In Alaska-Yukon O. czukotica is replaced by the pseudo-vicariant O. bryophila. It is notable that in the eastern part of Seward Peninsula, Alaska, where O. gorodkovii is normally absent, O. bryophila grows on limestone outcrops as well. In the amphi-Beringian subsection Mertensianae, O. mertensiana has proved to be the only species within the whole section that could cross the West-Siberian Plain and reach the Ural Mountains. Besides, it seems to be the only mesomorphic species within the section restricted to moist bare ground, sometimes even moist moss carpets. Section Orobia, one of the richest in species within the subgenus Oxytropis, includes 27 species and subspecies within the Arctic. It is one of the most difficult sections with respect to taxonomy, and it probably has given rise to the sections Baicalia and Glaeocephala. It is extremely polymorphic with several very close aggregates of species forming parallel series, which recall the series of homologous variation sensu N.Vavilov. Among these aggregates are Oxytropis adamsiana agg., O. leucantha agg. and O. sordida with a few races (see Appendix). The Far Eastern group of oxytrops with brick-red stipules somewhat overlaps the above division. Among the sordide-white flowered oxytrops are two series of races: the boreal-low arctic type of O. leucantha and the above arctic type of O. sordida. Among the red-stipule oxytrops there are species with red flowers (O. ochotensis), greenish-yellowish flowers (O. maydelliana), sordide-white ones with lilac spot on keel (O. evenorum Jurtz. et Khokhr.). With respect to sordide-white or yellowish-flowered oxytrops with lilac spot on keel, the question arises: are the arctic races of O. sordida s.lat. the derivatives of arctic-boreal races of O. leucantha s.lat.? In this case we might expect the correspondence in distribution between more southern, arctic-boreal, races and their arctic derivatives. However, that is not the case. It seems most probable that the O. sordida agg. has developed and spread independently of the O. leucantha agg. in Megaberingia in the epochs of exposed continental shelf. The eastern races of the O. sordida aggregate now persist in separate post-glacial refuges in contrast to the East European-Taimyr subsp. sordida which populated the arctic and subarctic areas as soon as they became free of ice. O. campestris (L.) DC. and its closest relatives in West Europe are the derivatives of the South-Siberian continental montane races. In northwestern North America, O. leucantha agg. is represented by O. hyperborea. But here we find more original plants with yellowish or lemon-yellow corollas without a lilac spot on keel and with a diploid chromosome number: 2n=16 (O. jordalii, O. varians). This complex in North America badly needs revision. Within O. leucantha (Pall.) Bunge we distinguish several subspecies, two of which (the hypoarctic ones) reach the southern Arctic. They are connected by intermediate forms in the contact zones. The treatment of geographically isolated races of O. sordida s.lat. as subspecies is based on the character of their variability (sometimes overlapping). But I cannot support the consideration of all members of the enormous supperaggregate O. campestris sensu amplissimo as countless subspecies of a single species (other considerations apart, it is practically inconvenient). In the same section there are also a few well-separated species, like the rather peculiar O. semiglobosa, a cryoxerophyte, endemic to North-East Asia, with the only close relative O. ajanensis (Regel & Tiling) Bunge with very local distribution. Oxytropis arctica demonstrates a very disjunct distribution in arctic to subarctic-montane Central Siberia, where an octoploid race (subsp. taimyrensis, with more flowers and leaflets) is distributed, and in the west to central North American Arctic, where subsp. 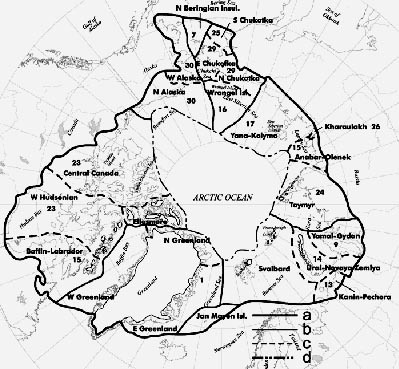 arctica occurs, with chromosome number records from the northwestern Canadian Arctic Archipelago 2n=80 and 96. Despite the enormous gap between the ranges of the both races (Kharaulakh  West Alaska), strongly overlapping variation argues against the Central Siberian race to be regarded as a separate species (O. karga Sapozhn. ex Polozhij). Oxytropis czekanowskii Jurtz. in the carbonate north-taiga landscapes in the upper reaches of the Olenek River, West Yakutia, might represent the ancestral form. A peculiar taxon is the rare Taimyr endemic O. tikhomirovii, intermediate (an intersectional hybrid?) between O. arctica (sect. Orobia) and O. nigrescens (sect. Arctobia) in its morphology. Formally it should be referred to section Orobia. The chromosome number of this plant is the same as in O. nigrescens, (2n=16), whereas O. arctica subsp. taimyrensis is octoploid, 2n=64. Section Baicalia is, in general, a Central Asian steppe group. In the Arctic it is represented by 7 species, belonging to 2 subsections (see Appendix). The subsection Inaequiseptatae includes 4 North Yakutian subarctic (2n=16,32,48) and 2 Alaska-Canadian prairie to subarctic species, two of which, O. schmorgunoviae and O. splendens, have reached the southern Arctic areas independently. It is the type of differentiation having kept the steppe morphotype. But both in Northeastern Asia and in Northeastern North America there occurs another type of differentiation: from true steppe plants to typical tundra ones. In Asia there is a series: O. schmorgunoviae (2n=48), to O. sverdrupii (2n=48) and O. wrangelii (2n=64). Oxytropis wrangelii represents the arctic morphotype, similar in appearance to O. arctica or O. sordida. It is robust even at elevation of 500 m above sea level on Wrangel Island. An analogous series in Canada is represented by O. splendens to O. bellii (from the Hudson Bay coasts, chromosome number not known). The second subsection Putoranicae is of Central Asian origin, a derivative of the high-elevation steppe subsection Chionobiae. It consists of two pulvinate species, both diploid: the metaarctic O. putoranica from subarctic Putorana Plateau and arctic Byrranga Mountains on Taimyr, and the high-arctic O. uniflora from one locality in the center of Wrangel Island (Yurtsev 1988). It is a marginal type in the genus, with its spike reduced to a single flower not exerted from the cushion (in O. putoranica 12 flowers, spike being slightly exerted). On Wrangel Island this plant has mature pods by the end of July, much earlier than all other oxytrops. The closest relative of O. putoranica in the subsection Chionobia is O. oligantha, a plant of alpine steppes of the Altai and Khangai mountains. This plant might have reached Putorana-Byrranga area during the glacial maximum of Late Pleistocene and then migrated across the exposed continental shelf eastward under cryo-arid climate. Thus, in this section we have avoided the category of subspecies. Section Glaeocephala is represented in the Arctic by 14 species and subspecies centered on the Oxytropis middendorffii and O. viscida aggregates (see Appendix). O. viscida agg. (2n=16 or 32) is closer to the non-arctic Orobia forms, than O. middendorffii with 2n=48. The first group (amphi-Beringian) comprises mostly hypoarctic species of the territories with continental climate; the second (East Siberian metaarctic) unites cryophilous arctic to metaarctic plants of the O. arctica general appearance. Among the seven subspecies of O. middendorffii the westernmost subsp. middendorffii and subsp. schmidtii look most advanced, whereas subsp. coerulescens and subarctic Yakutian subsp. jarovoi, least viscid, are probably closest to the hypothetic ancestor of this complex. The status of subspecies is confirmed by the existence of a wide zone of hybridization between neighbouring races and some overlapping variation. Oxytropis middendorffii subsp. anadyrensis with strongly glandular pods and calyx tube deviates from the O. middendorffii agg. towards O. viscida agg. and should perhaps be treated as a separate species. Subspecies schmidtii combines a number of characters of subsp. middendorffii and subsp. anadyrensis, and subsp. trautvetteri combines, in turn, those of the latter and subsp. submiddendorffii. They may represent hybridogenous taxa. Oxytropis borealis and O. glutinosa are closer to each other than to any representative of the above aggregates and might be considered as direct cryophilous derivatives of the O. viscida agg. as is the East Canadian O. hudsonica. Conclusions The dramatic asymmetry in distribution of oxytrops and other legumes between the North Atlantic and the Beringian sectors supports the hypothesis that Megaberingia is the main center both of species diversity and evolutionary diversification of arctic, metaarctic, and hypoarctic legumes, with maximal importance lying in the Asian sector of Megaberingia. In the contrast to Astragalus subgenus Phaca, there are no true mesophytes among the arctic oxytrops. Ecologically they vary from xeromesophytes and cryo-xeromesophytes to steppe xerophytes, xeropetrophytes or cryo-xerophytes. Only Oxytropis middendorffii subsp. middendorffii grows in mesomorphic herbaceous-dwarfshrub-moss tundra. The ancestral forms of the sections and subsections considered were probably restricted to unstable gravel or detrital substrates with low competition, which facilitated their adaptation to decreased summer temperatures and the shift to tundra environment. Notable also is the prevalence among the oxytrops growing in the Arctic of arctic, metaarctic or hypoarctic plants, but none that are true arctic-alpine or boreal. Amphi-Beringian species or subspecies are common, but those restricted to only one coast of Bering Strait prevail. As seen from the above examples, in the genus Oxytropis we widely use the category subspecies in cases of allopatry, though the cases of sympatry with partial overlapping of distribution areas are not excluded, as well as those of differences in chromosome number either among or within populations (in these cases autopolyploidy is most probable). In cases of morphological discontinuities in various characters (the possibility to identify each individual) we accept the rank of species even if the taxa have corresponding ranges (as in the case of Oxytropis nigrescens / O. czukotcensis: see above). In the polymorphic section Orobia well-separated species co-exist with parallel (homologous sensu N.I. Vavilov) series of closely related species along with polytypic species each with a number of subspecies. As an example, the section Glaeocephala where the arctic-boreal O. viscida agg. (apparently closer to the ancestral type of the section; 2n = 16 and 32) is broken up into series of non-contacting species, whereas the obviously derivative cryophilous O. middendorffii s.lat. (2n=48) consists of several subspecies merging in the contact zone. When selecting taxonomic rank for related taxa it is useful to elaborate a hypothesis of evolution in the group which, of course, should be tested in the future using all available methods. Dramatic speciation often takes place as a result of the populating of new adaptive zones by the ancestral species accompanied by the transformation of a morphotype (vertical evolution: examples are the section Arctobia and species of the subsection Inaequiseptatae of the section Baicalia). In certain cases the category aggregate is useful; but, hidden behind it, the two principally different cases: 1) a group where secondary hybridization mixed the representatives of different (sometimes not closely related!) groups in one complex swarm; 2) a group of species with a rather controversial (poorly understood) taxonomy. An aggregate may include representatives of different series, subsections or even sections. The recognition of distinctions between aggregate components makes such aggregates needless (an example: O. agg. nigrescens = subsection Arctobia with three series of species). Attempts to consider such enormous superaggregates as O. agg. campestris s. ampliss. at the rank of a species with tens of subspecies seem to be impractical and impedes the understanding of phylogenetic history of the group. While agreeing with the basic statements of Elven et al. (1999) regarding the use of the categories species and subspecies, one has to admit that in some complicated situations, the choice of a rank depends on the intuition and personal experience of the investigator (presumably of the monographer). The author owes sincere gratitude to many of his colleagues in Russia (especially at the Komarov Botanical Institute, the Russian Academy of Sciences) and outside it (in particular, in the Herbarium of University of Alaska Museum, Fairbanks, USA) for help during field studies, the possibility to examine herbarium collections, and to discuss problems of taxonomy. The present work, as a part of the Panarctic Flora Project, was supported by two grants from George Soros International Science Foundation (19941995) and a grant of the Russian federal program Biological Diversity. Elven, R., Jonsell, B., Murray, D.F. & Yurtsev, B.A. 1999. An operational species concept for the Panarctic Flora. - Det Norske Vitenskaps-akademi. I. Mat. Naturv. Klasse, Skrifter, Ny serie 38: 23-32. Gursenkov, N.N., Pavlova, N.S. (1984). Chromosome numbers of the representatives of the genera Astragalus and Oxytropis (Fabaceae) from the Far East of the USSR [Chisla hromosom predstaviteley rodov Astragalus i Oxytropis (Fabaceae) s sovetskogo Dalnego Vostoka)].  Bot. Zh. (Leningrad) 69 (11): 15691570 (in Russian). Høiland K. & Laane M.M. (1989). Flower substances in the extremely disjunct species Oxytropis deflexa and their phytogeographical implications  Can. J. Bot. 67: 218-224. Pavlova, N.S. (1989). Family Fabaceae. [Sem. Bobovye  Fabaceae].  In: Kharkevich, S.S. & Kozhevnikov, A.E. (Eds) Sosudistye rasteniya sovetskogo Dalnego Vostoka. Nauka, Moscow 4: 191338 (in Russian). Polozhij, A.V. (1994). Genus Oxytropis DC. [Rod Oxytropis  Ostrolodochnik].  In: Polozhij, A.V. & Malyshev, L.I. (Eds) Flora Sibiri. Fabaceae (Leguminosae). Nauka, Novosibirsk 9: 74151 (in Russian). Yurtsev, B.A. (Ed) (1986). Arctic flora of the USSR [Arkticheskaya flora SSSR]. Leningrad, Nauka 9, part 2. (in Russian). Yurtsev, B.A. (1988). A new species of the genus Oxytropis from the section Baicalia (Fabaceae) and the problem of continental relicts in the flora of Wrangel Island [Novy vid roda Oxytropis iz sektsii Baicalia (Fabaceae) i problemy kontinentalnyh reliktov vo flore ostrova Vrangelya]. - Bot. Zh. (Leningrad) 73(12): 1649-1661 (in Russian). Yurtsev B.A. (1994). Floristic division of the Arctic. - J. Veg. Sci. 5(6): 765776. Yurtsev, B.A. (1997). Analysis of evolutionary differentiation in key arctic-alpine taxa: Dryas, Oxytropis sect. Arctobia and Taraxacum sect. Arctica. - Opera Bot. 132: 2737. Yurtsev, B.A., Katenin, A.E. & Rezvanova G.S. (1994). Three local floras of carbonate landscapes in the northeastern Chukchee Peninsula. [Tri lokalnye flory karbonatnyh landshaftov na severo-vostoke Chykotskogo poluostrova].  Bot. Zh. (Leningrad) 79(1): 3446 (in Russian). Yurtsev, B.A., Tolmachev, A.I. & Rebristaya, O.V. (1978). Floristic delimitation and division of the Arctic [Floristicheskoye ogranichenie i razdelenie Arktiki].  In: Yurtsev, B.A. (Ed.) Arkticheskaya floristicheskaya oblast. Leningrad, Nauka.pp. 9104 (in Russian). Appendix Annotated draft checklist of the arctic species of the genus Oxytropis DC. 1. Oxytropis deflexa (Pall.) DC. ssp. deflexa. 2n=16. East Siberian-North Mongolian hypoarctic-montane type subspecies. 2. O. deflexa ssp. dezhnevii (Jurtz.) Jurtz. 2n=16. Endemic of the easternmost Chukotka Peninsula. Calcicolous. 3. O. deflexa ssp. foliolosa (Hook.) Barneby 2n=16. Alaskan-Canadian hypoarctic race. 4. O. nigrescens (Pall.) Fisch. 2n=16. East Siberian metaarctic species; the type species of the series. 5. O. czukotica Jurtz. 2n=32. Chukotka-Okhotia-Kolyma metaarctic species; the only locality in North America is Ogotoruk Creek at Cape Thompson in the northwesternmost Alaska. 6. O. pumilio (Pall.) Bunge. 2n=16 (the data from the northernmost Kuriles and southernmost Kamtchatka). Kamchatka-Kurile south-metaarctic species. The only specimen from the Panarctic Flora area was collected on the northern Koryak coast. 7. O. bryophila (Greene) Jurtz. 2n=16, 32(?). Alaska-Yukon metaarctic species with two localities in the easternmost Chukotka Peninsula. The type of the series. 8. O. glaberrima Hult. North Alaskan low-arctic montane taxon, its status needs further examination. It may be a glabrous race of O. bryophila. Known from the only locality on the northern slope of Brooks Range. 9. O. kokrinensis A.E.Pors. 2n=16. West Alaskan metaarctic endemic species, in part sympatric with O. bryophila. The vaucher specimen for K.Holmen's counting 2n=16 for O. nigrescens contains both O. bryophila and O. kokrinensis, but no O. nigrescens. 10. O. gorodkovii Jurtz. 2n=16,32. Amphi-Beringian arctic pulvinate calcicolous species. Tetraploid plants are sympatric with the diploid ones and have no visible morphological distinctions. 11. O. arctobia Bunge ssp. arctobia. Canadian arctic (mostly high-arctic) type subspecies with the main area of distribution in the Canadian Arctic Archipelago (the other race, ssp. subarctobia Jurtz. occurs in the northern Canadian Rockies). Pulvinate calcicolous plants. 12. O. sublongipes Jurtz. 2n=16. Hypoarctic species with a rather narrow endemic distribution in the inner (stlanic and taiga) parts of the Anadyr River drainage and in the northern Koryak Mountains; the plant of gravelly flood-plains with close but clearly distinctive species O. kamtschatica Hult. (Kamchatka Peninsula, Karaginskiy Island etc.) forms the subsect. Kamtschaticae Jurtz. possibly representing an ancestral type of the other lineages in the sect. Arctobia. 13. O. revoluta Ledeb. 2n=16. Kamchatka-North Koryak metaarctic oceanic species, the most typical of the alpine belt of the mountain-taiga areas. Weakly penetrates the Arctic along the Koryak Coast. The type species of the subsection (2 species in the easternmost North Asia). 14. O. podocarpa Gray. 2n=16. North American arctic-alpine species with great disjunction between northern Hudson Bay areas and the Rockies. The type species of the olygotypic subsection. The related species O. huddelsonii Pors. populates unglaciated alpine areas in Central Alaska. 15. O. scammaniana Hult. Alaskan metaarctic endemic species penetrating the Arctic in the central part of Brooks Range. 16.O. mertensiana Turcz. 2n=16. Siberian-Alaskan metaarctic species, typical of mesic-moist habitats. Oxytropis adamsiana aggregate (Nr. 17-23). 17. O. adamsiana (Trautv.) Jurtz. ssp. adamsiana. 2n=32. East Siberian metaarctic (mainly arctic) type subspecies of the very polymorphic aggregate. 18. O. adamsiana ssp. janensis Jurtz. 2n=32. East Siberian (mainly North-East Yakutian: Yana-Indigirka Rivers drainages) subarctic (northern boreal) subspecies, weakly penetrating the Arctic in the southern Kharaulakh Range along montane valleys. 19. O. uschakovii Jurtz. 2n=32. Endemic of Wrangel Island, closest to O. adamsiana ssp. adamsiana. 20. O. vassilczenkoi Jurtz. ssp. vassilczenkoi. 2n=32, 48. Chukotka hypoarctic type subspecies (mesophilous eco-geographic race), penetrating the eastern coastal areas with maritime climate. 21. O. vassilczenkoi ssp. substepposa Jurtz. 2n=32, 48. Indigirka-Chukotka hypoarctic subspecies (meso-xerophilous eco-geographic race) lacking in Chukotka Peninsula and Koryak Coast, but penetrating the North East Yakutia. Partly sympatric with the Nr. 20. 22. O. roaldii Ostenf. Alaska-Yukon arctic species which is usually considered a synonym of Oxytropis arctica; however by the structure of spike, calyx and pods it belongs rather to O. adamsiana agg., as well as the next species and, beyond the Arctic, O. davisii (Welsh.) Jurtz. in the Canadian Rockies. 23. O. terra-novae Fern. 2n=48. East Canadian hypoarctic coastal species, most common on Labrador Peninsula. Its position in O. adamsiana agg. is a bit questionable and needs special examination. 24. O. koyukukensis A.E.Pors. 2n=48. Alaskan metaarctic endemic species. Closer affinity is unclear. 25. O. arctica R.Br. ssp. arctica. 2n=ca.80, 96. West-central North American arctic type subspecies, with wider distribution on the mainland (in the Canadian Arctic Archipelago only on the westernmost islands). 26. O. arctica ssp. taimyrensis Jurtz. 2n=64. Middle Siberian metaarctic (mostly arctic) subspecies separated by a great gap from the westernmost localities of ssp. arctica. 27. O. tikhomirovii Jurtz. 2n=16. Middle Siberian (Taimyr) endemic weakly penetrating the subarctic Putorana Plateau. A plant with combination of characters of O. arctica and O. nigrescens, possibly a hybridogenous species, but with the chromosome number of the latter. One cannot exclude the possibility that the taxon has arisen due transformation of O. nigrescens alone. 28. O. semiglobosa Jurtz. 2n=16. North-East Asian metaarctic calciphilous species with rather sporadic distribution. The only closely related species O. ajanensis (Regel et Tiling) Bunge occurs in the vicinity of Port Ayan on the westernmost coast of Okhotsk Sea. 30. O. maydelliana Trautv. ssp. maydelliana. 2n=96. Amphi-Beringian metaarctic (mostly arctic) type subspecies of the Chukotka-American species. 31. O. maydelliana ssp. melanocephala (Hook.) A.E.Pors. Central East Canadian arctic subspecies. Oxytropis leucantha aggregate (Nr. 32-34). 32. O. leucantha (Pall.) Bunge emend. Welsh ssp. subarctica Jurtz. 2n=48, 96. Middle-East Siberian hypoarctic subspecies of the mainly East Siberian arctic-boreal-montane species O. leucantha (O. leucantha agg. is a part of what might be called the O. campestris superaggregate; see the comments above). The type ssp. leucantha is common in the boreal parts of Yakutia being replaced to the north and northeast by Nr.Nr. 32 and 33. 33. O. leucantha ssp. tschukotcensis Jurtz. 2n=48, 64, 96. Northeast Asian hypoarctic subspecies. O. dorogostaiskii Kuzen., with which it was previously confused, is an alpine plant of the southern East Siberia, of the same aggregate. 34. O. hyperborea A.E.Pors. Alaskan-West-Central Canadian metaarctic (or hypoarctic if taken wider) taxon closely adjoining O. leucantha agg., especially O. leucantha ssp. tschukotcensis. Possibly includes two or more races which need special study. 35. O. jordalii A.E.Pors. 2n=16. Alaska-Yukon metaarctic calcicolous species which does not belong to O. leucantha agg. and probably should be referred to North American complex (e.g. O. varians agg. ), together with Nr. 36 and O. gracilis (Nels.) Schum. 36. O. varians (Rydb.) K.Schum. 2n=16. West American boreal (montane) species reaching the southern boundary of the Arctic at last near Great Bear Lake. Delimitation with O. hyperborea should be specified (with respect to the areas of distribution). 37. O. johannensis (Fern.) Fern. Mostly subarctic species of the Atlantic coast of Canada (Gaspe Peninsula and its vicinity); the arctic records should be checked. Oxytropis sordida aggregate (Nr. 38-43). 38. O. katangensis Basil. Middle Siberian boreal species mainly restricted to the Yenissey River drainage and reaching the southern limit of the Arctic in the Yenissey valley near Dudinka. Its relationship to the O. sordida agg. is probable (one of the possible progenitors of this lineage). 39. O. sordida (Willd.) Pers. ssp. sordida. 2n=48. East European - West and Middle Siberian mainly arctic type subspecies of the Eurasian-West American arctic-to metaarctic species. The zonal type of distribution in ssp. sordida changes from the arctic-boreal in the west to the metaarctic in Ural Mountains and arctic in the Yamal-Gydan and Taimyr areas. 40. O. sordida ssp. arctolenensis Jurtz. 2n=96. Kharaulakh low arctic (montane) endemic subspecies. Some characters are in common with O. leucantha ssp. Subarctica which is spread in the Arctic to the northwest and east of the northern Kharaulakh (and elsewhere). 41. O. sordida ssp. schamurinii Jurtz. 2n=96. North-East Asian arctic (montane) subspeices with disjunctive distribution in the north-eastern Yakutias mainland (the northernmost point), in Wrangel Island and in the northern Chukotka Mountains. 42. O. beringensis Jurtz. 2n=96. Northeasternmost Chukotka Peninsula low arctic calcicolous rare endemic species, clearly belonging to the O. sordida agg. The consideration of this taxon as a subspecies of O. sordida should be discussed (Yurtsev et al., 1994). 43. O. sordida ssp. barnebyana (Welsh) Jurtz. Alaskan arctic endemic with sporadic distribution and prominent interpopulationary variability which is still greater expressed in a close taxon ssp. schamurinii. The plant is similar in general appearance to O. arctica, with which it is sympatic in Alaska, but also with the east Taimyr population of O. sordida ssp. sordida and with ssp. schamurinii. American authors evidently underestimate the diagnostic value of colour of petals (red versus sordida white with lilac spot on keel). So, the plant of concern was described as O. arctica var. barnebyana Welsh. and, vice versa, many red-flowered oxytrops are referred to O. campestris s.lat. (see above the comments on parallel race-formation in closely related groups). 44. O. schmorgunoviae Jurtz. 2n=48. Hypoarctic montane-steppe endemic species with disjunctive distribution in highly continental right bank parts of the Kolyma River drainage penetrating the Arctic in the northern foothills of Anyui Mountains. Belongs to the North-East Asian mountain-steppe O. scheludjakoviae Karav. et Jurtz. agg. 45. O. sverdrupii Lynge. 2n=48. Arctic tundra-steppe endemic species of Ayon Island (northern Chaun Bay). 46. O. wrangelii Jurtz. 2n=64. Chukotkan arctic endemic species, known from Wrangel Island (many localities) and two localities in the western and central Chukotka Peninsula. 47. O. splendens Dougl. North American steppe and prairie species, reaching the southern boundary of the Arctic at the south-western coast of Hudson Bay. Closely related to O. scheludjakoviae agg. 48. O. bellii (Britt.) Palib. Arctic species endemic to the western and northern coasts of Hudson Bay and to some neighbouring territories. 49. O. putoranica M.Ivanova. 2n=16. Middle Siberian metaarctic pulvinate rare endemic species, the type of the subsection. 50. O. uniflora Jurtz. 2n=16. Wrangel Island arctic endemic calcicolous species found in the very centre of the island in one locality. Oxytropis viscida aggregate (Nr. Nr. 52-54). 51. O. vasskovskyi Jurtz. 2n=16, 32. East Siberian hypoarctic (montane) species penetrating the Arctic within Anyui Mountains and on Ayon Island (western Chukotka). 52. O. inopinata Jurtz. 2n=16. East Siberian (the montane valley of the Lena River in its lower reaches) hypoarctic rare endemic species. 53. O. kateninii Jurtz. Eastern Chukotka Peninsula low arctic rare endemic species (a single locality known). 54. O. viscida Nutt. 2n=16, 32 (non-arctic populations). West American boreal-montane highly variable species recorded for few southern mountainous parts of arctic Alaska. 55. O. borealis DC. 2n=48. Amphi-Beringian mainly arctic (metaarctic in Alaska) species, possibly the arctic derivative of O. viscida agg. In the eastern Alaska is replaced by a close species (race?) O. glutinosa. The demarcation with the following taxon should be specified as well as the relation of the pair to the O. viscida affinity. 56. O. glutinosa A.E.Pors. 2n=16. East Beringian metaarctic species. 57. O. hudsonica (Greene) Fern. Central Canadian-West Hudsonian low arctic species of a more distant affinity of O. viscida agg. 58. O. middendorffii Trautv. ssp. middendorffii. 2n=48. Middle Siberian metaarctic (mostly arctic) type subspecies of the East Siberian-North-East Asian metaarctic species O. middendorffii s.lat. (Nr.Nr. 58-64). 59. O. middendorffii ssp. orulganica Jurtz. 2n=48. East Siberian (Orulgan Range) hypoarctic (montane) endemic subspecies, weakly penetrating the Arctic in the northern Kharaulakh Range. There is a transition zone to ssp. middendorffii. 60. O. middendorffii ssp. submiddendorffii Jurtz. 2n=48. Chukotkan arctic subspecies replaced in the subarctic Verkhoyansk Range and Cherskiy Range by the closest ssp. jarovoi Jurtz. 61. O. middendorffii ssp. coerulescens Jurtz. et Petrovsky. 2n=48. West Chukotkan (Anyui Mountains) metaarctic (montane) endemic subspecies. 62. O. middendorffii ssp. schmidtii (Meinsh.) Jurtz. 2n=48. Middle Siberian (East Yenissey) hypoarctic (montane) subspecies endemic to Norilsk Mountains near the forest tundra boundary; combines some characters of ssp. middendorffii and ssp. anadyrensis. 63. O. middendorffii ssp. anadyrensis (Vass.) Jurtz. 2n=48. Chukotkan mainly low arctic subspecies with outlying localities (non typical forms) in the subarctic North-East Yakutia and in the Koryak Mountains. Somewhat deviates in its morphology to O. vasskovskyi. 64. O. middendorffii ssp. trautvetteri (Meinsh.) Jurtz. West Okhotian southern hypoarctic subspecies with a remote locality on South Chukotka (Pekulney Range, non-typical form). Table. Distribution of taxa of the genus Oxytropis DC. within the Arctic. Grade of commonness/rareness of a taxon within the area: c - common (frequent), s - sporadic, r - rare. Explanation of the names of floristic areas is given in the legend to Fig. 2 and on Fig.1. Send mail to webmaster@binran.ru with questions or comments about PAF web site.